TPO Roofing (or Thermoplastic Polyolefin) is a single-ply roofing membrane that is among the most popular material for use in commercial roofing. The flat or low-slope shape of many commercial buildings requires well-suited products to protect from flooding and structural wear. TPO is a highly waterproof, durable material that is more cost effective than its single-ply counterparts, such as EPDM and PVC. (We install, repair, and recommend all of these single-ply options, however.) For repair, replacement, or installation of TPO Commercial Roofs in Knoxville, TN, call us at (865) 385-6926! In Chattanooga, TN, calls us at (423) 702-4042! Single-ply membrane roofing in general is a great choice for commercial properties! The materials are flexible, lightweight, and easy to install. The synthetic substance is heated for application, then cools in its final, durable state to protect the surface of your roof from weather and wear. TPO may be applied in one of several methods: point-affixed, fully-adhered, or mechanical attachment. We will discuss and determine the best method of application based on your unique structure. 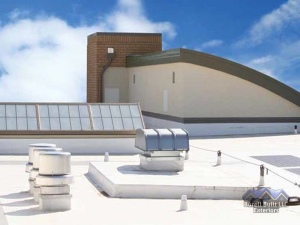 TPO Roofing is an exceptional choice for our commercial customers, and we look forward to telling you more about the benefits of this roofing system. We can compare all the materials appropriate for the slope and location of your property. There many quality products available, so we can discuss your budget and goals to come up with the perfect solution for repairing, re-roofing, or installing the system from scratch! Contact us to learn more. Is your single-ply roof in need of some help? Do you even know the condition of your current roofing system? Fear not! We can help. Contact our offices in Knoxville or Chattanooga for a thorough inspection of your existing roof, and let us help you make the right choices when it comes to maintaining and repairing your TPO commercial roof. Many repairs can be performed quickly and affordably. However, issues left untended and negligence to the roof overall can lead to more costly, significant repairs or even replacement down the road. Protect your investment by setting regular maintenance visits, and reach out to us as soon as you’re aware of any issue (or potential issues) with your roof. We look forward to chatting with customers about TPO commercial roofs in Chattanooga, TN and Knoxville, TN! Call us or complete the form for a free estimate. Updated on September 16, 2016 at 1:51 pm by Burell Built Exteriors.